At least we are having a bit of a winter this time after last year’s poor attempt. After sleet and snow showers Wednesday night, don’t be surprised to wake up to a snow-cover in some places. The theme continues on Thursday with frequent sleet or snow showers and a strong bitter north-westerly wind making it feel sub-zero. Further accumulations of snow likely in some localised areas, especially on higher ground but as is the case with showers, not everywhere sees enough to give a covering. Max 4’C. Friday is another day of wintry showers. However it shouldn’t feel as cold with less of a wind and the showers should be more scattered. Still feeling cold though. Max 5’C. An icy, frosty and maybe foggy start to Saturday. Sunny spells with some scattered sleet and snow showers. Cold breeze from the North Pole. Max 3’C. Sunday in general looks a drier day with some bright spells. Odd snow shower may persist on the hills. Remaining very cold with a moderate frost early and late. Max 3’C. Looking ahead high pressure should build in bringing settled conditions but we stay under the influence of cold air so frost and fog become the main concern. Follow @ChadWeather on Twitter for all your local weather forecasts. It looks like the very cold spell is set to end. Thursday will be a very cold day but settled. Mainly cloudy with some local sunny spells and apart from the odd flurry or patch of drizzle it will be dry. Highs of 3°C. It’s all change as we head into Friday. Cloudy with some rain pushing in from the west which might be preceded by sleet or snow, on higher ground. Winds swing to a south-westerly and hence slowly introduce milder air. Further rain or showers likely into the evening and a thaw of current lying snow begins. Highs of 6°C. A bit tricky as we head into the weekend. I’m expecting Saturday to be a day of sunny spells and showers. Some maybe wintry with hail or sleet. Maybe an overnight frost. Highs of 5°C. Sunday looks more of a cloudy day. Any early brightness replaced as light rain comes in again from the west and milder once again. Highs of 8°C. Looking ahead we get into the pattern we had a few weeks ago. Cold showery days with milder rainy days in between. Temperatures up one day and back down the next. Follow @ChadWeather for your local weather updates. 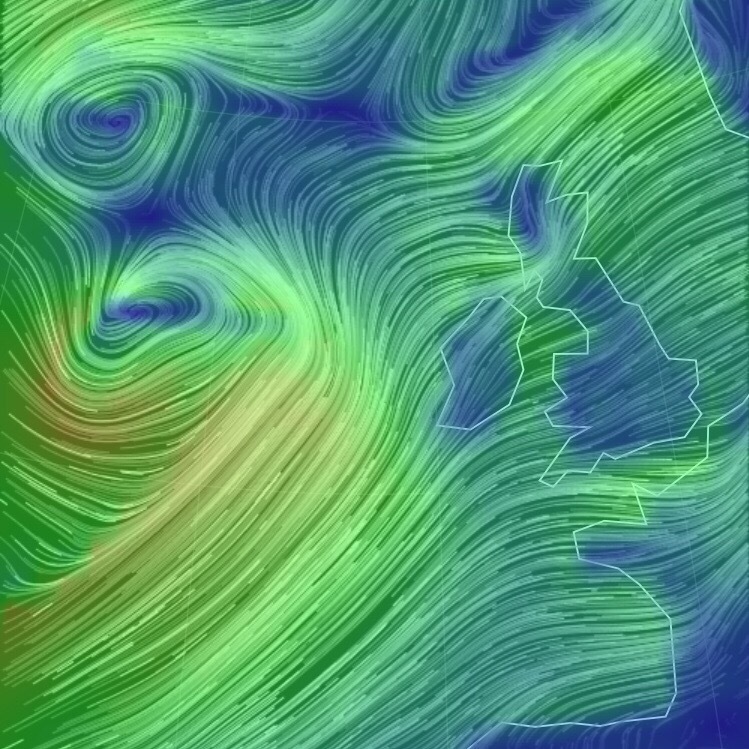 We are now into mid-January and mid-winter and having our fair share of gales and rain. It’s not unusual in January but so far we have had more than average. 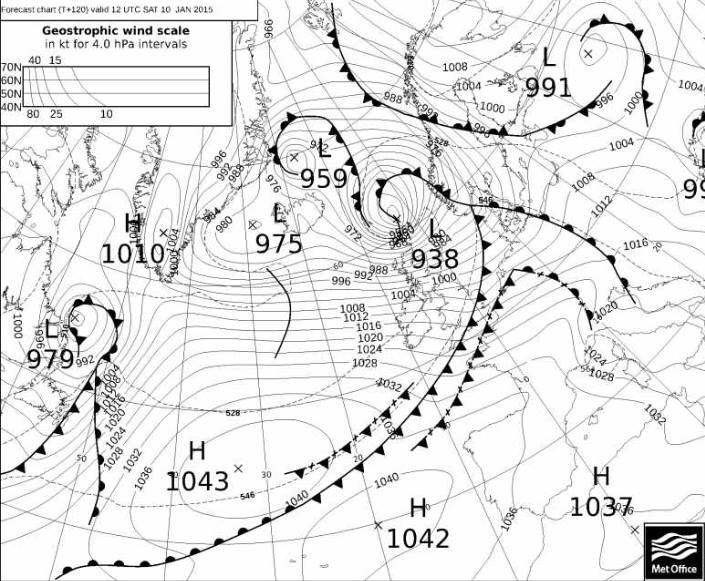 The photo below shows our Wednesday night and Thursday storm brewing nicely in the Atlantic. After a very windy Wednesday evening we start Thursday with lively weather still present. It will be a day of sunshine and blustery wintry showers and these heavier later into the evening. Feeling cold and winds gusting to gale-force. Highs of 6°C. Friday sees showers, again wintry so don’t be surprised to see hail, snow and even hear a crack of thunder. A fresh west to north-westerly wind making it feel sub-zero. Highs of 5°C. We go into Saturday under the influence of a cold airflow. Sunshine and wintry showers. These might merge during the morning with some hill-snow but the tendency is for the showers to ease later in the day. Still cold but the winds will be lighter. Frost and ice overnight. Highs of 4°C. Sunday looks a reasonable day with some nice winter sunshine and a good chance it stays dry. Winds light so it will be a cold start and a widespread frost will set in after dusk. Highs of 3°C. Looking ahead it remains cold with some wintry showers and night-frosts. Snow at times might become more likely but I’m not holding my breath. I hope you all enjoyed your Christmas holidays and all the best for 2015. We have a wet and windy outlook in this week’s forecast. Below is a Met Office chart showing a stormy forecast for Saturday with a very deep area of low pressure giving 60-70mph gusts locally and in excess of 100mph gusts in Scotland. Time to fix all that garden furniture down before it ends up halfway down the street. Thursday will be a showery day but also remaining breezy. Most of the showers will be in the morning and they should ease during the day. Feeling chilly especially in the wind with highs of 7°C. More active weather on Friday as another low pressure rattles in from the Atlantic with a period of rain during the afternoon and very windy conditions with possible gales. It will turn much milder. Highs of 13°C. Rain or showers on Saturday morning which should ease slightly later. Another very windy day with gales or even severe gales across the region. Certainly one to keep an eye on with gusts to 70mph possible. Turning colder later. Highs of 11°C but this during the first part of the day. Any overnight showers might be wintry. Sunshine and showers on Sunday and again the topsy-turvy weather is cold with some of the showers wintry or with hail. Highs of 6°C. Looking ahead milder again with some rain on Monday then cooler with a breezy and showery theme. Hints at something colder after mid-month.